The gallery theme this week is Animals. I thought about posting a picture of the concrete cows here in Milton Keynes, or even the Wooden Cows that we found in Geneva. I thought about the elephants that we went to London every week to find last Summer or even the hundreds of pictures of animals in wildlife parks, Zoo's and farms and even ones we have seen in the wild when we have been on walks and rambles in the local area. Instead though I thought I a picture of Top Ender from a few years back would be more fun. As you can see Top Ender was a chubby little Baby and she loved to smile for the camera from a very early age. One Easter I decided to take a few photos for posterity and took the above snap. She loved it, she sat there surrounded by chocolate with her bunny and wearing her bunny ears and grinned. The ears fell off at one point but she just giggled and sat there smiling for the camera. I look at Top Ender now and think how amazing it is that the baby in this picture became the girl I see today. I take her for granted at times, I know I do. Tops picks up toys and hugs her brother when only she is the one that will do. She takes things to the kitchen and runs upstairs to fetch me things I have forgotten. She looks at me believing that I know everything and when I look at her I see her growing up before my eyes morphing into this beautiful young woman. I don't think that I say this enough but Top Ender (yes I know you are reading this I see you have this blog bookmarked on your laptop and your bedroom PC) I am so very proud of you and I love you so very much. Please don't be in too much of a rush to grow up, enjoy the times we have together as much as you can. Last year when my sister and I talked about our Christmas Traditions we talked about booking tickets to go and see Father Christmas. It was decided by my Sister that she was going to try and see him at Harrods, as it was something that she would love to start as an annual holiday tradition for her and her family. As I hate going into London during December I didn't try to book tickets I know from previous years that Harrods at Christmas is amazing, with the whole store being themed. Last year the theme at Harrods was a Vintage Christmas in celebration of J.M.Barries Peter Pan and my sister confirmed that walking through the store was amazing. 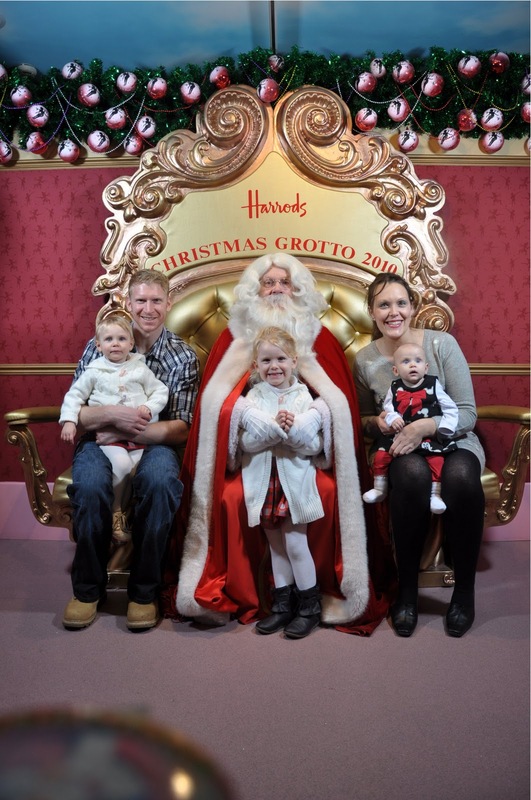 The actual Santa visit resulted in the first family photograph of the entire family together, some gifts from Santa and lots of fun and made me just a teeny tiny bit jealous, as the whole thing cost just a £5 booking fee! That's right other than the booking fee, going to see Santa at Harrods is free (and the £5 is credited back to your rewards account to be spent in store before the end of the year). Seeing as my Sister and I are both Harrods Rewards Account Holders we might just both book to see Santa this year. You will have to be quick to join us though, as you need to sign up for a Rewards Account and the grotto booking will be opening in just a few short days! Okay the first week's picture is below. I'm saying nothing, but come on caption away! We were sent some Speedo Sea Squad Learn To Swim goodies. In one short year Big Boy will be starting school, before then though we are going to cram in as much fun as possible and complete as many things from our Things to do before Starting School List. One of the items on this list is to learn to swim and so when Speedo sent over some products from the Sea Squad Learn To Swim range we knew we had no excuse to achieve this goal! The Speedo Sea Squad Website was launched in January and is a good site for children to explore and has some great downloads available for keeping track of your swimming progress. This is great as it helps me to know what to encourage Big Boy to do when we go to our local pool. There are some great videos and printable guides for parents to use as a resource and you will see soon there are some mentions on my facebook page as I have linked the two up. Sorry I couldn't help it I am a Social Media Addict! Top Ender has had a play on the Kid Zone area of the Speedo website too playing the game, printing door hangers and pictures to colour in! So what did we think of the goodies that were sent? The Speedo sea squad armbands were Big Boys favourite as they had green on them, and anything green is a big hit! I had a bit of trouble blowing them up and deflating them initially because the Valve seemed to be stuck, but I soon discovered the knack of blowing up and deflating the armbands. They were a good size too, as they weren't too bulky on Big Boy despite being for an age range of 2-6.Daddy thought that they were a bit thin, but I think it is because the armbands are PVC free. The RRP for the armbands is £7. The Speedo sea squad googles have been used for almost everything by Big Boy. I was chopping onions and so he used them, he had his hair washed and so used them and he was dressing up as a superhero and so used them! I take it to mean that they are comfy and as the nose band and the strap for around the head are both adjustable you can get just the right fit for just about any head. Unlike some goggles that we brought for Top Ender (they were Speedo too) they didn't seem to have anti-fog and so we were constantly cleaning them. The RRP for the googles is £5 and the frames are made of silicon with the lenses being polycarbonate. The Speedo sea squad dive rings were jumped on by Top Ender as soon as the packaging was open. When Top Ender was having Swimming lessons to build up her confidence in the water (she could swim she just wouldn't believe us when we told her) the instructor regularly threw rings or sticks into the water for Top Ender to collect. The idea is that children dive to the bottom of the pool to retrieve the rings and this increases their confidence in the water. We invented a lot of games with the rings when we were in the pool and even Big Boy had fun hunting for them in the water. The RRP for the Rings is £12 for three. The Speedo sea squad Minikick is a much more manageable size than other floats that we have purchased in the past, which means that it is easier for Top Ender and Big Boy to handle. I never understood the purpose of a float, but Top Ender's swimming instructor explained that they help to improve (and develop) kicking technique as with the arms not doing the work the legs have to! There was a lot of fun in the pool with the float, the only problem was trying to get Top Ender to put it down to practice using her arms too! The RRP for the Minikick is £7 and it is made from EVA. I know that these products are available from other outlets (I saw them in Sainsbury's) and that if we keep going to our local pools that Big Boy will be swimming in no time! No editing, this was the colour of the clouds the other evening. Very dramatic and beautiful. This coming school year is the last year that I will have Big Boy at home with me, as in September 2012 he will be starting school. 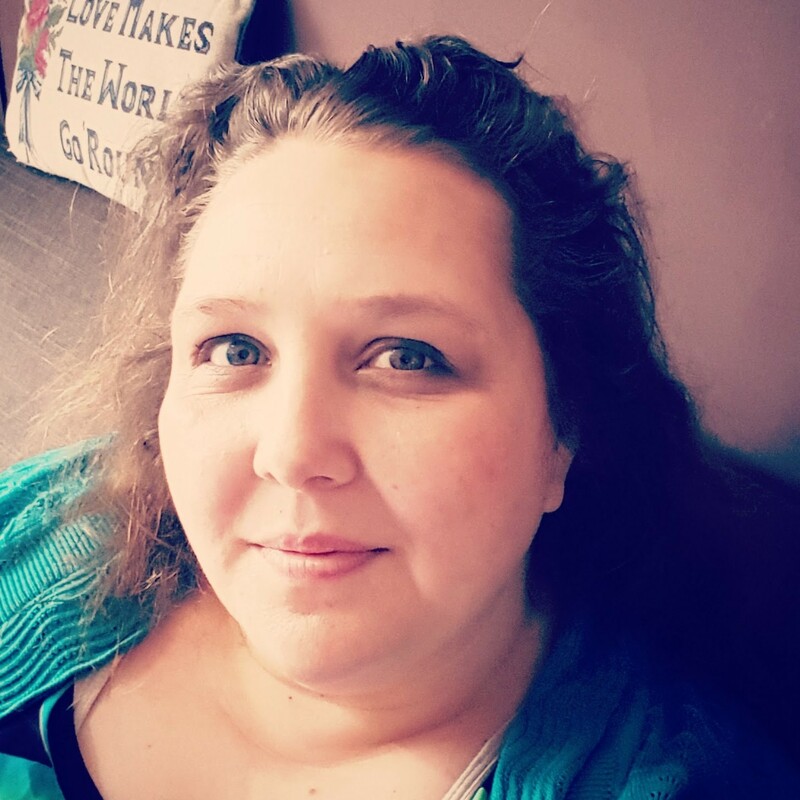 I asked on my facebook profile what people thought I should do in this last year with Big Boy at home and had some emotional responses about how this time will fly by and some great suggestions about things we might enjoy doing together. I already knew that this time was going to pass in what seemed a heartbeat, as it doesn't seem like five minutes has past since I realised that Top Ender would be going to school and now she is getting ready to start year three. I am sure that Big Boy and I will do more than this in our time together this year, but do you think there is anything missing from our list to make the most of our time together? What did you do to make sure that you were ready for your children to start school? I like to try to keep the house clean (if not tidy) for the family and making the various chores fun isn't just for the benefit of Top Ender and Big Boy but for my benefit too! I am sure if I worked out just how long I spent cleaning, doing the dishes or shopping I may pass out from shock as I am sure the number of hours would be longer than I spend asleep. Then again that might just be a reflection on how much sleep I get! Cleaning the bathroom is one of my most satisfying chores and using the e-cloths (that I reviewed as part of my Green Clean Challenge) means that the chore doesn't take long. Every morning whilst I am in the bathroom I give the bathroom a quick wipe over to keep things looking fresh. I find that this only takes a few moments but seeing as I am in the bathroom anyway it makes good sense and keeps the bathroom looking clean. I know that with an e-cloth that you don't need to use bathroom cleaner, but I like the smell of bleach and so once a week I use my "old methods" of cleaning the bathroom whilst Top Ender and Big Boy are in the bath. I get to clean the toilet and the sink (I do the floor once a week when I do the kitchen floor) whilst supervising bath time and we normally have a little giggle singing daft songs too. Top Ender and Big Boy help out by using bath crayons and drawing all over the bath and the tiled wall around the bath. 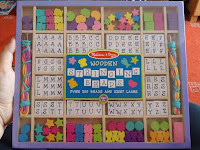 This gives them something to do before I can help them wash their hair and also means that when they have finished in the bath and they have to wipe away all the crayon the bath and the wall will be all washed down too! Having fun whilst cleaning the smallest room of the house has built a lot of memories for Top Ender and Big Boy and I am sure that it will continue to do so for many more years to come! Growing up I remember having Afternoon Tea at my Grandparents on a Saturday afternoon with my family. There were always sandwiches with the crusts cut off and fondant fancies and other small slices of cakes and of course a pot of tea for the grown ups and orange squash for us children. It was something that we looked forward to, the weekly Saturday Afternoon visits and the treat of cakes and being allowed to sit in the living room instead of the dining table. As a child I didn't understand the comfort of the routine, I just liked the cakes but I was being taught the family Afternoon Tea tradition without knowing it. Top Ender and Big Boy often play tea party, and this Summer they have so much fun together pouring water from their teapot and orange squash from a milk jug into little cups and pretending to eat sandwiches and cake. I have joined in on several occasions and I have been teaching them the unwritten rules of an English Afternoon Tea as opposed to High Tea, which is something very different. Top Ender and Big Boy had been so well behaved (with a couple of goals having been reached) that I decided that they deserved a treat of a proper afternoon tea on our formal dinnerware. We don't often use our formal dinner set so Top Ender and Big Boy were very excited about seeing the posh tableware coming out of the cupboards. The first part of afternoon tea is the sandwiches. We went with the traditional ham sandwiches, cucumber sandwiches, egg mayonnaise and knowing that Top Ender and Big Boy like to be untraditional we also went with ham and cheese sandwiches. Top Ender and Big Boy were delighted at these delicate sandwiches and with all bar the egg mayonnaise having the crusts cut off (they are easier to hold that way!) they were pleased at not being told to remember to eat their crusts! The important part of an afternoon tea for any child is the cakes and Tops and BB were lucky to have a large selection of cakes to choose from. We had to have fondant fancies as a tribute to the afternoon tea's of my past, and Big Boy and Top Ender both choose their favourite cakes too so we ended up with small chocolate topped cakes and a selection of differently topped Chocolate fairy cakes. They had to obey the unwritten afternoon tea rule of eating all the sandwiches before having any of the cakes, but they were allowed to be over indulgent on the cakes and did manage to consume more than they probably should have! The last part of afternoon tea is probably the least important part for non tea drinkers like Top Ender, Big Boy and I but we did know that we had to use the teapot and tea cups for our Orange squash to keep up the formal afternoon tea image! The afternoon tea was a big success with Top Ender and Big Boy and they are looking forward to having afternoon tea again soon. Although I think that they might be more interested in the cakes than the sandwiches! 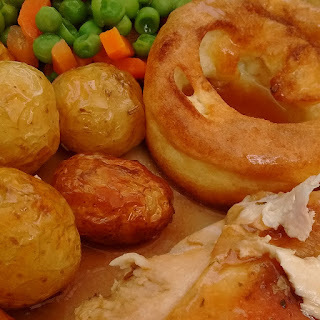 In our house we have a couple of gravy fanatics, and so during the colder autumn and winter months we will have quite a few meals that use gravy in some form and of course we have it every Sunday when we have our Sunday Roast. For me the issue comes when we have finished with the Gravy, there always seems to be some leftover no matter what quantity I made in the first place! Luckily though I have a few ways to use up the gravy as waste not want not! The first option is to freeze it in ice cube trays. When Big Boy and Top Ender were small I would often do this and then could add an ice-cube of gravy to their home made dinners. Now that I don't have to worry about making Baby food I still freeze some left over gravy and then add to rice to give it a bit more flavour. You can also do this with noodles and pasta, just make sure that you aren't adding a sauce as this sometimes makes the sauce taste funny. It doesn't have to be frozen to be added to a meal for flavour though. Adding gravy to home made soup can give it a depth and a deeper flavour. Everyone knows that leftovers are lovely in a sandwich, and the same can be said for Gravy. I like open top sandwiches with gravy drizzled a little over the top! If you have a lot of leftovers from a meal (I'm thinking Sunday Roast here) then you could serve the vegetables and the gravy together the next day and make a new meal with the base from yesterdays meal. If you are planning on using the gravy in another meal you could make a Casserole, or a pot roast, or a pie or even add it to Meatloaf. As with any leftover make sure it is all heated to an even temperature when you recook the food. Poutine is a French Canadian junk food/comfort food that can use up leftover gravy quite easily. I am sure that I don't make it the right way, but it tastes delicious! Take a bowl of chips and scatter some fresh cheese curds over (I can't get fresh cheese curds all the time so cheat and use grated cheddar) and then pour on your hot leftover gravy. The cheese melts and the gravy and the chips all fuse together to make a really stodgy but tasty dish. Or if you are Top Ender you could always drink it! 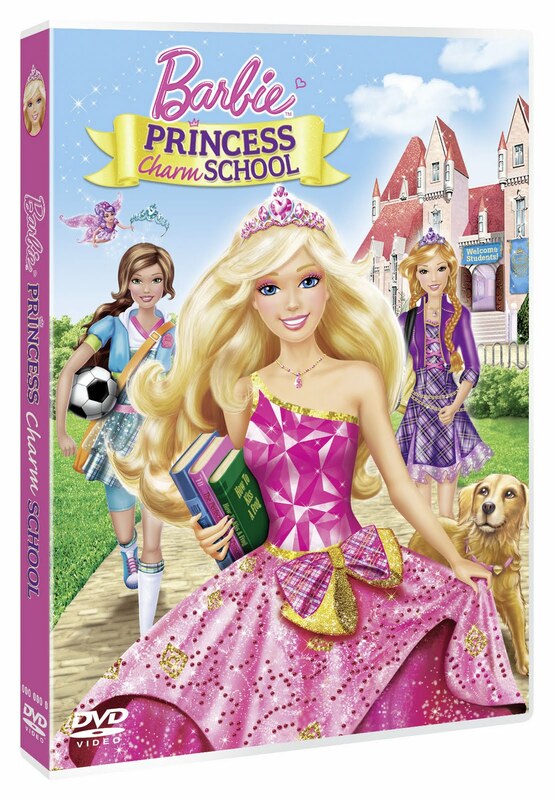 We were sent a copy of Barbie Princess Charm School on DVD. Top Ender is very much a Barbie girl and was waiting for the Barbie Princess Charm School DVD to be released at the end of August, so that she could use her Summer Holidays savings to purchase it. 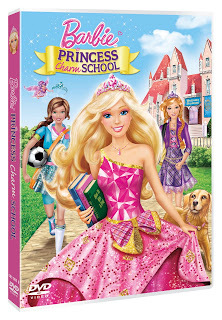 When on Saturday the postman delivered a parcel to me containing a preview copy of Barbie Princess Charm School I was suddenly propelled to superstar status with the promise that we would watch the film together that afternoon. 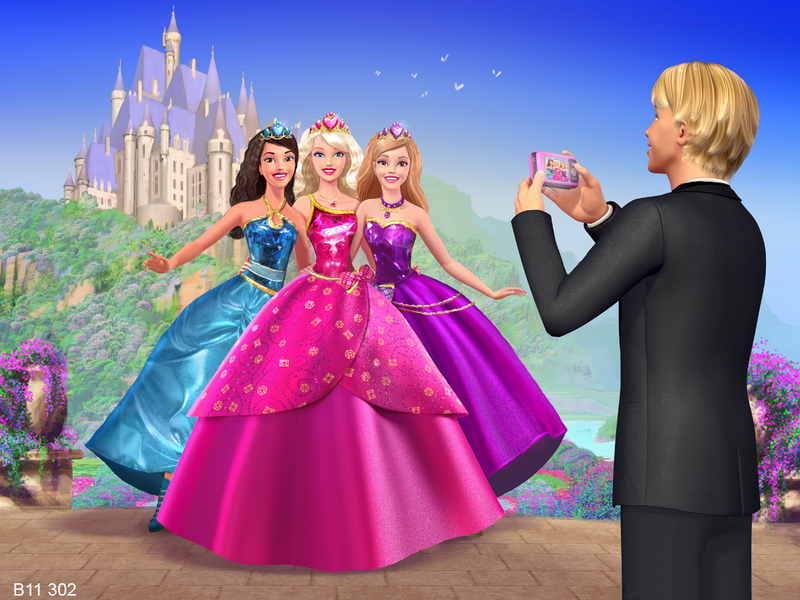 Barbie Princess Charm school is about a young girl called Blair Willows, who is a kind but slightly clumsy young girl and is chosen via a lottery to attend Princess Charm School. 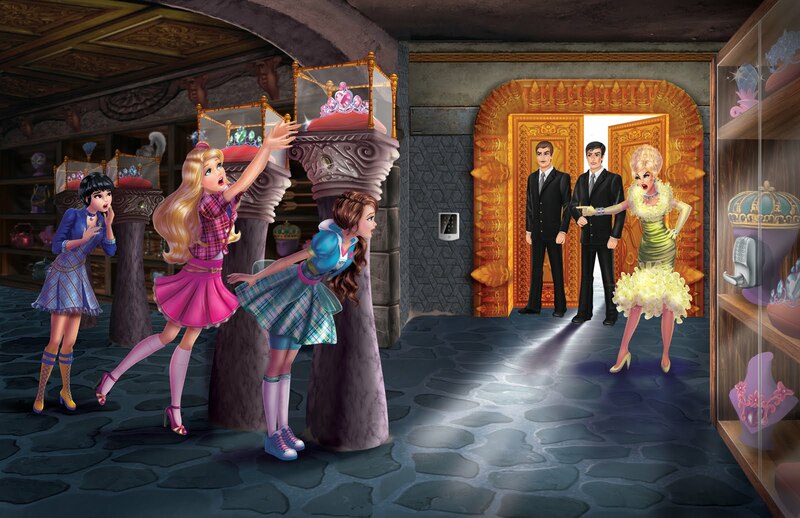 You see even in Gardinia (where this is set) before you can become a Princess or Lady Royal you have to have some training to build character and to learn the proper etiquette for being a princess! 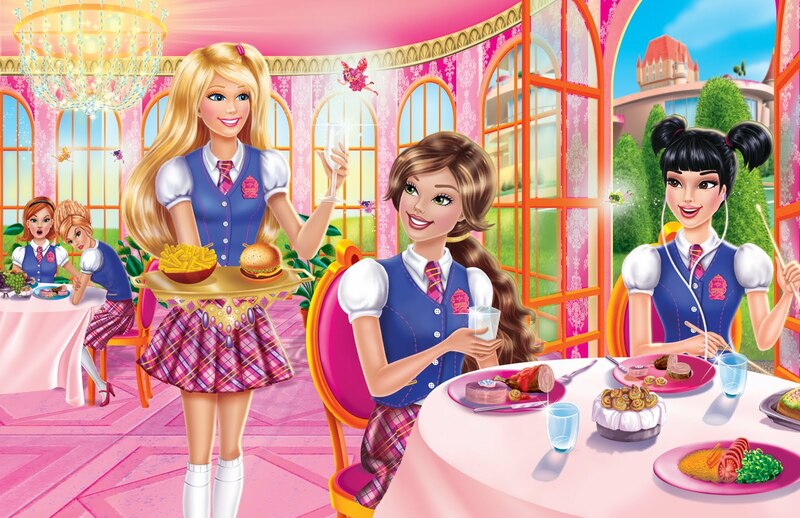 Blair attends the school with several young ladies of her age and shares a room with Princess Hadley and Princess Isla (The Princess Charm school is a boarding school). 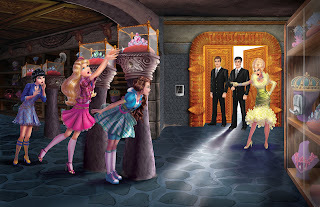 They tell Blair the legends of the royal family of Gardinia including the tale of how some believe that the Baby Princess Sophia somehow survived the terrible accident that killed the rest of the royal family leaving the Queen's niece (Princess Delancy) next in line to the throne. As long as she passes the tests at Princess Charm School that is! 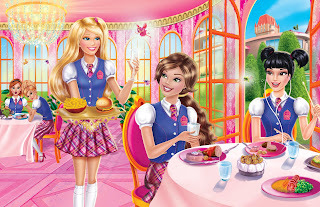 There are two evil villians, the soon to be crowned Princess Delancy and her mother Dame Devin (who is an etiquette teacher at the Princess Charm School) both of whom take an instant dislike to Blair and try their hardest to have her expelled. Blair doesn't let anything get her down however and keeps trying her best as she is doing this for her younger sister to have a better life. The film is bright and colourful and easy enough to watch even is the story is predictable. The good thing about predictability though is that it is easy to understand and has the important happy ending and a confirmation that everyone is a princess even if they haven't been brought up in a castle or have a Queen or King for a Mum and Dad. The DVD is a must have for any Barbie fan and watch out for the merchandise to go with this latest film. It had been one of those days where everything was wrong and the only way to make it better was cake. Big Boy seemed to misunderstand the purpose of the cake as he wanted candles on the Birthday Cake, even thought it wasn't anybody's birthday. So I started plotting an Unbirthday treat for the next day just because like with our fake Christmas we celebrated last year we could! Luckily Daddy understood that out of the 365 days of the year that 361 of them were our joint Unbirthday's and the next day just happened to be one and that was an Unbirthday worth celebrating! We started the Unbirthday at Sunday Lunch when both Top Ender and Big Boy were presented with Unbirthday cards. I have a large selection of Birthday cards which were easily converted into UnBirthday Cards by writing "Un" in front of Birthday! Top Ender and Big Boy loved these cards and enjoyed the thrill of getting to celebrate something which normally passes without recognition. 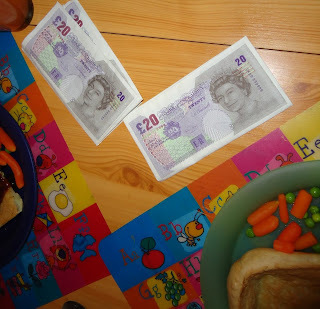 Dinner was eaten with high spirits, even more so as we had some new napkins which made it look like we were super rich and using bank notes to gently dab our mouths as we were eating! They look real don't you think? I make Yorkshire Pudding every Sunday as part of our weekly roast (not just when we have Roast Beef) and sometimes we have a lot leftover, it has to be said that it is rare for there to be leftovers but it does happen. As part of my waste not want not mentality I have a few ways to use up the leftover Yorkshire Pudding that Top Ender and Big Boy love as an after school treat on a Monday night. Last week we went to a local woods for a walk. We spent time dodging puddles (Goblin ponds) and smiling at Dog Walkers and other families out for an afternoon stroll all whilst having a giggle together and enjoying the sunshine. It was a really lovely afternoon and one that made me think in more detail that night about what a good family life we lead and how Daddy and I are lucky to have the sort of marriage and family that many people spend years trying to find and we just stumbled into. Splitting up all chores in to parts and giving everyone a specific role when doing the chores works well for us as a family. This way Top Ender and Big Boy both get to learn how to do a chore without being overwhelmed with having too much to do and it can be made age appropriate. Just liking mowing the lawn, if you get into a routine of sharing the work it helps speed things up and encourages co-operation from everyone! When we go shopping we work off a shopping list that I create. I have a basics shopping list of things that we need every week (and month) and will check what we need as I go along creating the list. I check out the prices on the website My Supermarket and go through the products that we use most regularly to see if they are on special offer. Then the fun part starts. 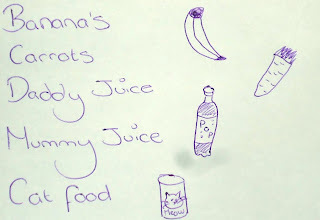 When just Big Boy and I go shopping I will create a list for him, complete with drawings (as he can't read yet) for him to see what we need and for him to be in charge of putting into the trolley. I used to do this for Top Ender too and I think that like Flash cards the drawings help associate that all objects have a written representation and help encourage reading! Giving children something to focus on whilst shopping really helps them to find the chore more fun and normally means that you don't spend the time rushing round the supermarket throwing in various items that your child has asked for and you have agreed to get to keep the peace! If everyone is going shopping we normally change what we are doing slightly and work from just one list. Sometimes it will be Top Ender carries the list and calls out what we need from the list with Big Boy finding the item and putting it into the trolley with the help of Daddy and I or we might split into teams to race to do the shopping. Racing to do the shopping is great fun because you choose items that are close together in the supermarket and give one or two items to each team to get. One team has to take the trolley with them and the other team has to rush off and return to the trolley before the team with the trolley gets their items! We find that this works well as the shopping takes about half the time and anything that speeds up the shopping is fun in my book! We received a package of Lego Duplo Cars 2 as part of Big Boy's Lego Duplo Expert review responsibilities! Big Boy loves Lego Duplo and almost everyday we have it scattered across the floor making up wild and wonderful creations. Since finding out that it fits with the ordinary Lego too we have made some truly amazing city scapes and Big Boy likes to make farms for his tractors to plow too. When a big package for review arrived during the Summer Holidays Big Boy was very excited to see that it was Lego Duplo scenes from his favourite film Cars 2! I managed to persuade Top Ender and Big Boy that I had to make up the scenes with them before they could play with the sets and quickly took a few shots of the different sets. The first set we made up was the Agent Mater set (which has an RRP of £13.49) which was great fun at aiming the missile at the two brick targets included with the set. Big Boy soon came up with the idea to see who could get their missile to go the furthest though and so with the help of Top Ender they were eventually launching the missiles down the living room and measuring the distance covered! I then opened up the Big Bentley Lego Duplo set (which has an RRP of £40.99) which comes with Finn McMissile, Lightning McQueen and of course Mater! I loved the Way Out sign and when Big Boy and Top Ender were allowed to play with this set very quickly set about creating different situations for the three cars. You can't really see Big Boy, but that is his knee in the edge of the shot! Don't forget to comment after linking up! Over the last couple of weeks, the children and I have got our day out Essentials down to the most needed and essential items for a successful day trip. 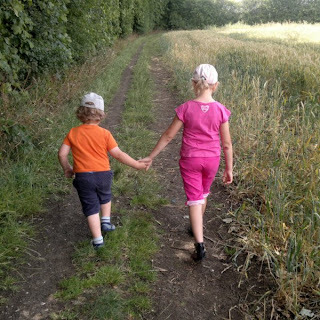 We have by trial and error come up with the Top Ten Items that you need for a successful fun family day out, that will hopefully save you the trouble that we have had on past day trips. A back pack is the easiest thing to put everything into when you and the family are heading off out for the day. Just remember that when you wear the backpack properly (over both shoulders) it spreads the weight and doesn't cause damage to your back. Plus with it being on your back it means you have two free hands and everyone knows you need two hands for eating ice-cream with! Just something small and not messy, so no chocolate or chocolate covered biscuits. Ours tends to be cereal bars or bread sticks as they are small and compact and have a longer shelf life. This will save a lot of moaning about being hungry, will help if someone is starting to feel the effects of low blood sugar and maybe most importantly will distract some children from doing something they shouldn't! We have several water bottles and will take them filled with cold water when we go out on a trip. This means we don't have to buy a drink whilst we are out and we don't have to worry about stains from accidental spills! The other great thing is that water is of course good for you. 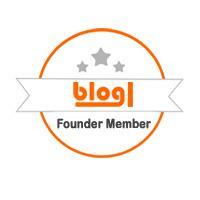 For more Silent Sunday Shots click on the logo below my picture. It's no secret that I love Milton Keynes. There is a lot going on here for families to have fun doing and despite what a lot of people think there are a lot of green spaces, (many of which have featured in posts of family days out or family activities here at A Mothers Ramblings) and a lot of those green spaces are managed by The Parks Trust. The Parks Trust are a fantastic organisation and put on regular events through the year at various Green spaces, but it is the Open Air Film Festival at Campbell Park in August that gets us here excited the most. 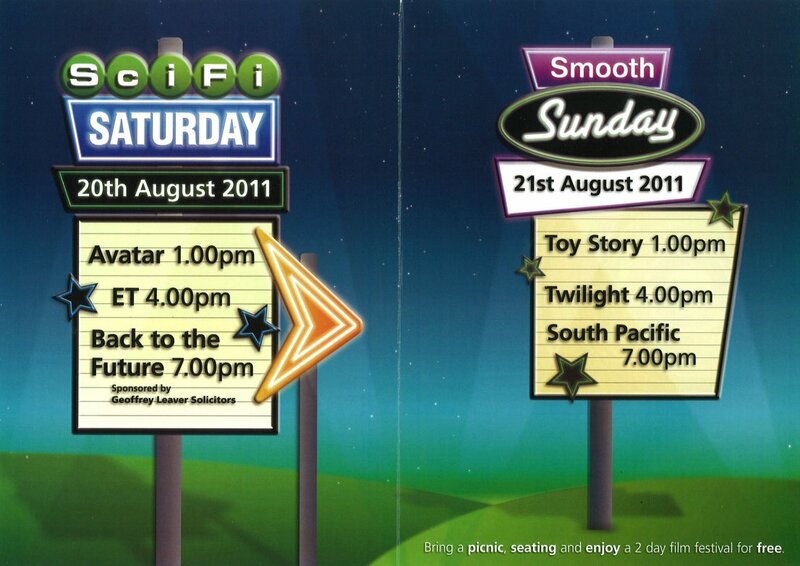 Every year a cinema screen is set up, in Campbell Park (near the Shopping Centre) and over the weekend six films are played out to the gathered audience. 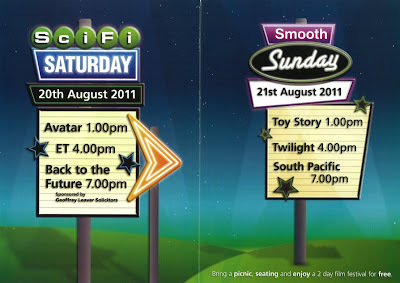 A few years back we went to see Grease with Top Ender and Big Boy and this year if the weather stays fine we are hoping to pop along to a few films over the weekend. We are really looking forward to introducing Top Ender and Big Boy to Back to the Future and hope that they will love the film as much as Daddy and I do! Just in case you are in the area come and join in, the event is free and it is great fun to watch a film in the outdoors. Just remember to bring a picnic blanket and a picnic to make sure everyone is comfortable and happy! When I was sent the Xbox at Christmas to help with increasing the amount of exercise that I do I was full of great plans about getting up early, going to bed a bit late, having time to myself during the day to exercise and I was really fired up. I got over the wire not being long enough and even worked out how to position my furniture so that I could have the needed amount of space to exercise in and even managed to get up before Big Boy a couple of times to get a bit of early morning exercise in. And then life started getting in the way. 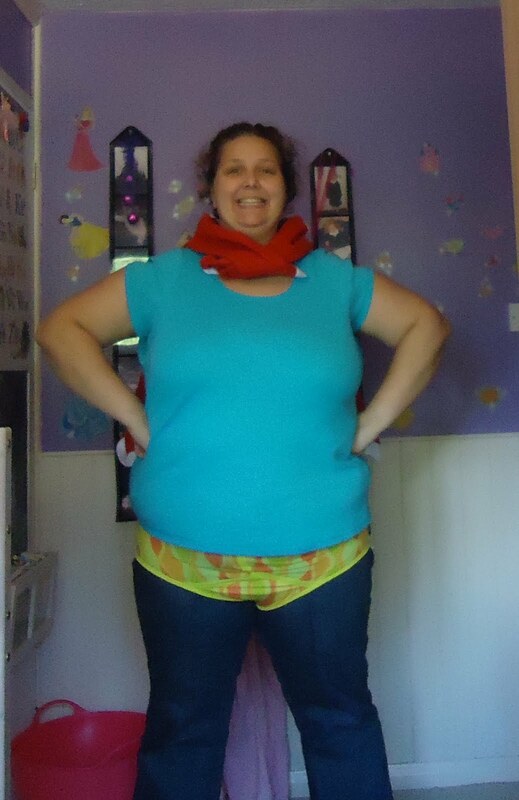 I stopped exercising, I stopped trying my hardest to fit it in and I put on more weight. There are so many fantastic features on the game, extra downloadable content and ways for me to see my goals but if you haven't got the time to exercise then it doesn't matter how great the content is, how amazing the graphics are or how amazing it is to see you in the game instead of an avatar because you aren't using it for anything other than collecting dust. So what to do? How can I make sure that I keep to my goals? Well, with Emma's wedding less than a year away and the Vic looking amazing it has helped me focus on my goals again. I don't want to be fat, I want to be healthy. 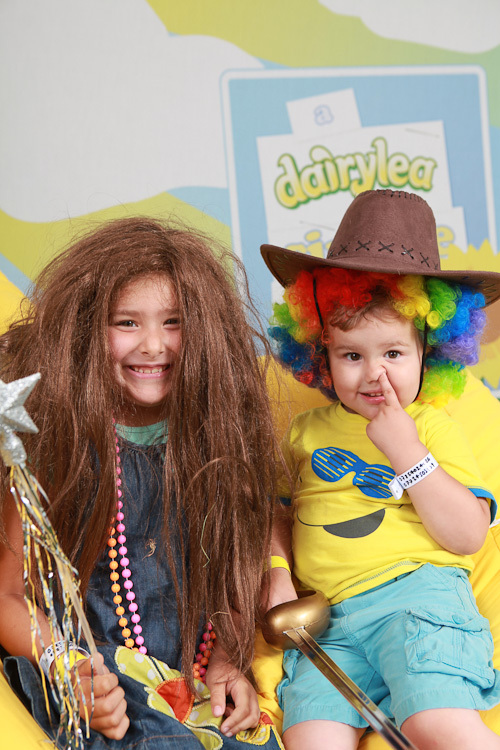 The team at Dairylea arranged for tickets for us to go to Camp Bestival, which was very kind of them indeed. 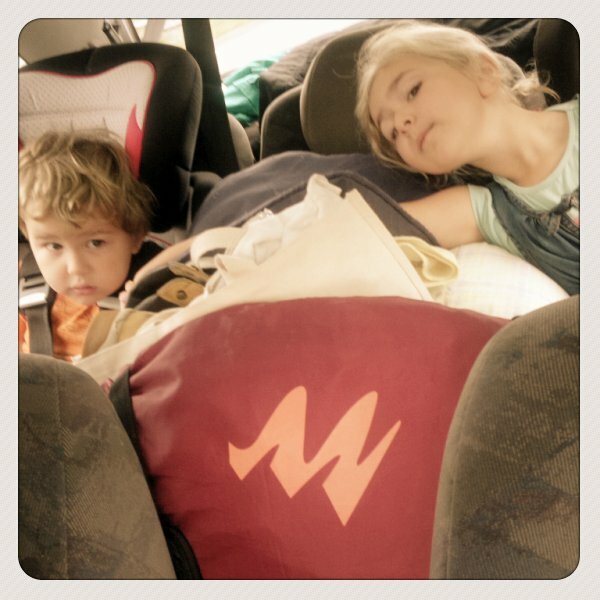 Early on Friday morning Top Ender, Daddy, Big Boy and I piled in to our stuffed car to travel down to Dorset for Camp Bestival. We were excited to be going to a Festival together as a family, to be camping together as a family for the first time (instead of just Top Ender and Daddy) and also we quite like Dorset thinking it to be a very pretty area. The whole journey and setting up camp area could be described as easy with only one minor melt down when I couldn't set up the supplies tent because I had forgotten which way the poles went! 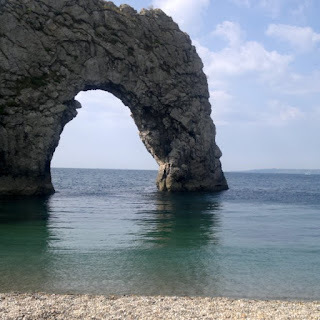 When we were in Dorset we drove to Durdle Door, as something that Daddy and I always comment on is that in the United Kingdom nothing is ever that far away (we are an island after all). It was a glorious British Summer morning and so we thought we should have a bit of fun and walk down the steep 800 meter long path and down the scary steps (I nearly turned back around and went back up as the stairs got narrower and I started to panic a little) to the beach and sat down on the shingle. For those who don't know Durdle Door is part of the Jurassic Coastline of Dorset and Devon and is a World Heritage site (yes all 95 miles of it) and it is a nice place to sit and paddle as the beach is sheltered and so it doesn't get too windy. Top Ender and Big Boy weren't disappointed that there was shingle instead of sand on the beach at Durdle Door and set about building stone piles instead of sand castles. We had taken buckets and spades down to the beach but it wasn't easy creating piles using them as the stones just kept sliding off each other! Top Ender then decided to create a hole deep enough for the whole family to sit in, which even with the help of Big Boy they soon discovered that this wasn't easy going so they gave up and wandered down to the waters edge to have a little paddle. The water was cold but it was refreshing on such a warm day and they were enjoying themselves so much that Daddy and I soon joined them. I know I said this the other week in I must go down to the sea again, but the beach is a place for children and childlike behaviour, a place for grown ups to be children again and I can think of no better way to relax and renew your energy and your faith than by paddling in the sea with your trousers rolled up around your knees. If you are ever in the Dorset area take a trip down to Durdle Door and have a paddle or stand on the top of the cliff and look down at Durdle Door and Man of War Bay. I promise that you will not be disappointed with the view.